Editor’s Introduction: In this week’s Magic Oddica TheMisprintGuy tackles a rare type of misprint in which a small run of Mercadian Masques foils escaped the factory with a very unique type of error. Check out Chapter XVIII of Keith Adams‘ Magic Oddica to learn all about these unique collectibles! So, Wizards of the Coast has recently been bought by Hasbro, and we’re fresh off of two fantastic blocks – Tempest and Urza’s block. Enter a new set: Mercadian Masques. For those of us that were playing at this time, we couldn’t help but feel a little bit let down. Masques was a bit weak, but there’s always some good news when changes are made; mistakes. Mercadian Masques was a set that had quite a few different mistakes. Quality control was apparently asleep at the wheel again, making this one of my favorite sets in recent years. The foil process was still fairly new, and many cards didn’t turn out quite right. The one mistake that stood out was a small run of cards in which the lettering was severely shifted, shown here. All of the text, as well as the black area between the cards did not line up with the rest of it, resulting in this mess. 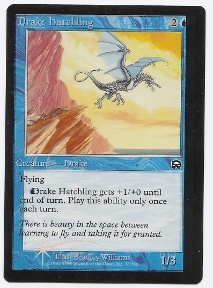 Also notice, all mana symbols, be they in the text box or in the top right, are printed at a different time than the art and frame, as seen in the Drake Hatchling. The mistake itself is rather simple, the printing process is done in more than one step. Nearly always they are done correctly and line up, however these cards show the rare moment that they do not. There’s at least one copy of every common like this, and the uncommons and rares in the set got similar treatment as well. Also, the judges I talked with have allowed them in tournaments, so this always adds to the desirability of cards that are often used like Brainstorm, Gush, and Dark Ritual. 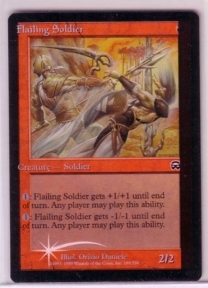 Note I have also covered Masques’ foil rares in the past, they released some with upside down backs. Paired with these, as well as standard misprints like crimped cards and miscuts, Masques is one of Magic’s most mistake-laden sets out there. And do you think I’m close to done showing you mistakes from this set? No… you’ll just have to stay tuned!